I love seeing my favorite indie dyers and designers collaborate on special projects — especially when it’s for something as special as Rhinebeck. Massachusetts-based designer Valerie Hobbs recently worked with Alice O’Reilly of Backyard Fiberworks on two designs that will be showcased at the Indie Untangled Rhinebeck Trunk Show next Friday, Oct. 20. 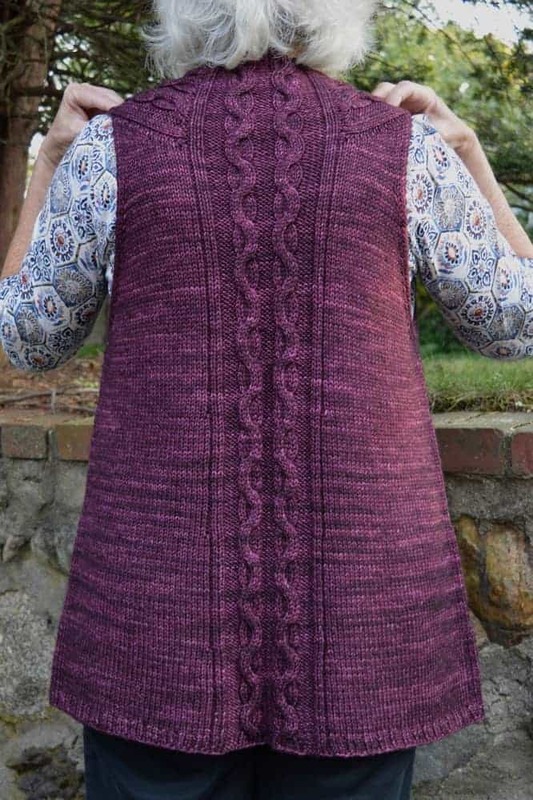 The Winter Creek Vest, pictured on Valerie above, was knit with Backyard Fiberworks Field, a 100% Superwash Merino worsted weight, and her Meadow Cardigan, which will be released Nov. 1, uses Backyard Fiberworks Meadow, a DK weight MCN. Both garments will be on display at the Backyard Fiberworks booth at the show. When Valerie is not designing patterns, she works as an interior designer and furniture consultant for a large university. I asked her to tell me a little more about her inspirations and herself. Tell me what inspired the Winter Creek Vest and Meadowbrook Cardigan? Winter Creek – I was playing with a long scarf and came up with the idea of shaping it around the neck and having the ends drape down the front, and then adding stitches for the armholes and body. The stitch pattern was from a cowl I had designed previously but never published. I made a fleece mock-up to figure out the draping, and the shaping of the armholes and neck. Meadowbrook – This one started as a sketch. I had an idea for a cardigan with columns of lace that started at different points. I then turned to my stitch dictionaries to find the right lace and ended up modifying a stitch pattern from a Japanese stitch dictionary. When I had the sweater almost completed, the lace and cashmere seemed to call out for a ruffled collar. I checked with my daughter, who has excellent taste, and she agreed it would be the perfect finish! How does your work as an interior designer inform your knitwear designs? I work at a university – my interior design work is classic and functional to fit my clients’ needs, and I think my knitwear design is similar. What made you decide to start designing knitwear? Like so many designers, I was always modifying patterns, whether they were for knitting or sewing. 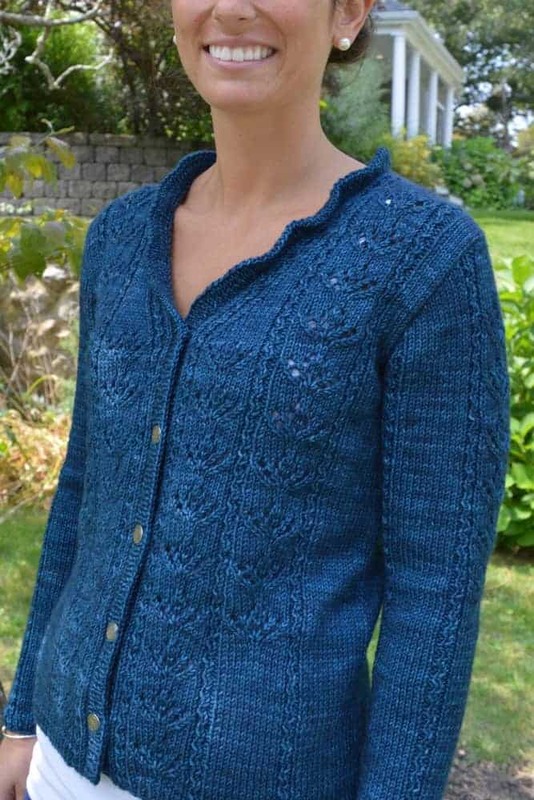 About seven years ago, I designed a cardigan because I couldn’t find the style I wanted. I got so many requests for the pattern on Ravelry, that I published it, and then a couple of years after that, started designing more seriously. I’ve always been a designer one way or the other, whether in the theater, where I worked in costume design and construction, or as an interior designer, or for my own personal needs. So when I reconnected with knitting after a long break, designing knitwear seemed like a natural choice. 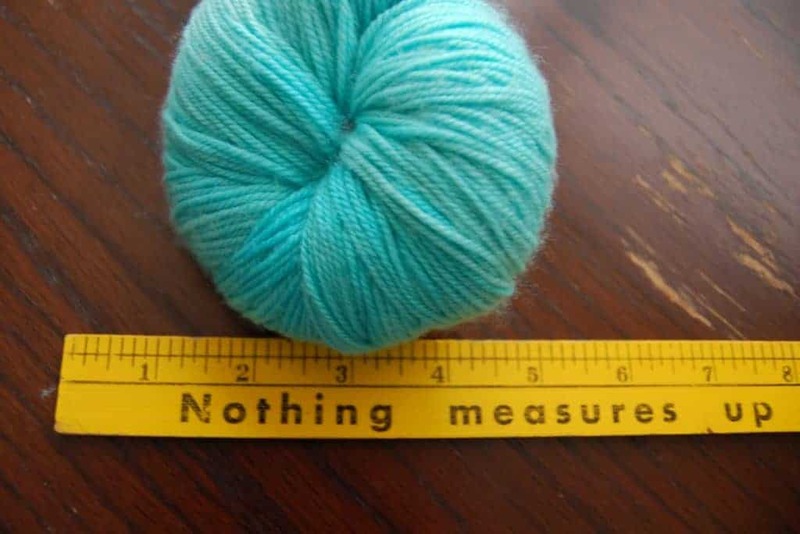 I’ve been knitting for so long I don’t even really remember. I think my grandmother taught me the basics, but mostly I learned from books — it was the pre-Internet era! Usually, I’ll start with a sketch. I’m always scribbling down ideas – I even have a notebook in the car for those times I’m stopped in commuter traffic. When I’m ready to start a new design, I’ll go back through my notebooks to see what inspires me. Sometimes I’ll have a yarn or a stitch pattern in mind as I look at the sketches – and if not, I’ll go through my stitch dictionaries, look through my stash, research options, draw a schematic. And then I swatch!! What are some of your favorite colors and how has designing changed them? I like all colors except orange! My favorite is purple – but I’ve been staying away from it because it’s so hard to photograph. I seem to be using a lot of blues most recently. Have you been to Rhinebeck before? What are some of your favorite things to see there? Yes, I’ve been traveling there with a group of knitting friends for the last few years. My favorite thing – looking at the sweaters, shawls, and other knitted objects that people are wearing! And of course, all the yarn! This entry was posted in Q&A, Sponsored post and tagged backyard fiberworks, indies, interview, patterns, rhinebeck, rhinebeck trunk show, sweaters, vest. 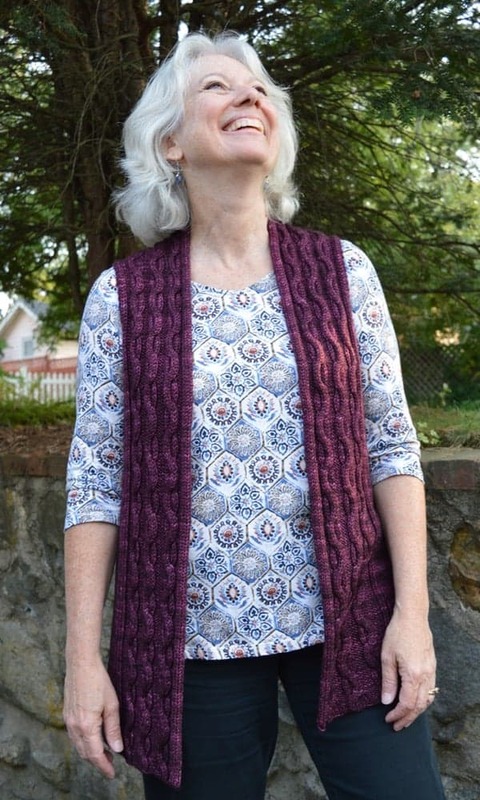 I am in love with this vest pattern! I had to buy it immediately and I will be shopping for yarn at Rhinebeck. Thanks!